Entertainment Everywhere – What if all your entertainment systems worked in flawless harmony, delivering your favorite music, television, movies, and more throughout your entire home? Dim the lights, warm up the room, and turn on your music—even before you arrive. We can intuitively create perfect moments by applying your preset preferences to an infinite selection of media. We have reinvented home entertainment with complete control and unmatched convenience. A single, elegant interface lets you enjoy consistent experiences across multiple devices; from your remote, touch panel, personal tablet or phone. However you choose to interact with your home theater, our intuitive interface remembers your preferred actions and will respond accordingly—creating a completely custom, personalized experience. What’s your ideal theater atmosphere—lights dimmed, shades drawn, and surrounded by perfectly-equalized sound? 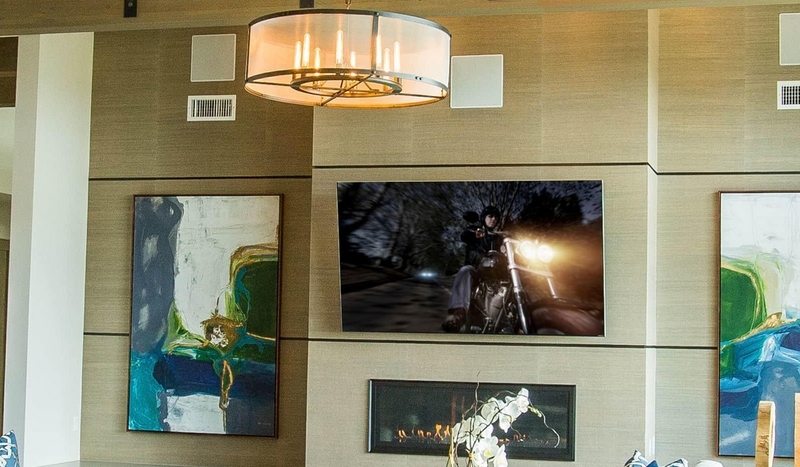 With IT and Media Solutions, a single touch turns your media room into a total cinematic experience. All you have to do is sit back and enjoy the show. We offer virtually limitless options to meet your needs while remaining elegant and effortless across all devices. Whether you’re selecting different media for each space or playing your favorite rally soundtrack throughout your home, IT and Media’s got you covered. While the movie watchers are immersed in a total home theater experience, your favorite music can fill the family room or the evening news in your study. Multiple TVs can likewise be linked, playing independent content in each room, sharing the same media, or any mix in between. Taking the party outside? Just bring your remote or mobile device. Friends can take turns controlling the TV, movies and music without having to dash inside. We offer the same solutions that offer intuitive access to endless audio and video options throughout your home seamlessly transition to all of your outdoor spaces. It’s your castle, and now you can keep it perfectly comfortable with a single tap. Remotely control your thermostat, lighting, and shades or allow our systems to cater to your preferences, maintaining the perfect level of comfort while you’re home—and conserving energy when you’re not. Imagine a home automation system that intuitively caters to your preferences without digital distractions—keeping your family comfortable while you conserve. From lighting, shades and climate control to outdoor systems, and anticipates your perfect environment. We keep your home comfortable and energy-smart without a second thought. Intelligent features automatically anticipate your needs for indoor temperatures, managing shades, heating or cooling systems. Remote access also helps you heat and cool more efficiently, turning off systems from your smartphone or tablet if you’ll be away for longer than expected. Finally, it provides a detailed history of your energy consumption, enabling you to monitor usage and make informed decisions without opening a single utility bill. It turns on smart lighting to greet you when you wake up or return home. Expecting company? A single touch sets the perfect party mood. Once you’re ready for bed, double check that all lights are off and security is “on” using your remote, touch panel, personal tablet or phone. One “Goodnight” button does it all. Protect what matters most with more than a locked door. Our systems integrate seamlessly with top security systems—giving you complete peace of mind. We make home security smarter by integrating all your systems into a single interface. With just a single touch of a button, your Smart Home will turn off the lights, ensure the garage is closed, doors are locked, and your security system is activated. With the convenience of remote access, you can receive alerts, arm, or disarm the system from your mobile device—whether you’re at home or a thousand miles away. Is the smoke alarm triggered? It will immediately shut down your HVAC system, minimizing the spread of smoke. While emergency response is being notified, internal and external pathways are lit to help your family exit quickly. Answer the front door from the backyard or accept a delivery while still at the office. Your private network hub for communicating anywhere, this lets you see, hear, and respond to visitors, whether you’re on the couch, in the car, or out of the country. Answer your door, accept a package, or let the plumber in even when you’re away. Own a vacation home? Give friends instant access without making the drive. It doesn’t matter if you’re in the kitchen, at the office, or on a tropical island. Our Intercom makes it easy! You can even link multiple homes, so you can check on the kids at Grandma’s house just as easily as looking into the next room. With a single, elegant interface across all devices, it keeps you connected to your loved ones—wherever they may be. When integrated with security cameras, we deliver a full view of your surroundings as well as two-way conversation, helping you monitor a baby in the next room or a triggered sensor light outside, and all without moving more than a finger. Experience complete control, convenience, and peace of mind whether you’re at home, at work, or on the go. Take your Intercom anywhere in the world, with the intuitive mobile app, smart enough to play any of the custom tones when the app is open, and send push notifications when the app is not open. And for times when you want to unplug, a Do Not Disturb function is available on every interface. The Intercom provides doorbell, paging and true point-to-point intercom functions that integrate seamlessly with all of your interfaces and controlled multi-room media systems. Unlike hardware-based systems, our Intercom supports the widest selection of stations on the market, including touch panels, Android & iOS mobile devices, video doorbells, and even PC and Mac computers allowing you to choose the type of station that best fits your lifestyle.